The futuristic dystopia of Crysis 3 just got a bit larger with this morning's announcement of a new downloadable addition dubbed The Lost Island. Designed to appeal to multiplayer fans, The Lost Island features four new maps, two new gameplay modes and an undisclosed number of new weapons. Most crucially however, it transports players from the urban ruins of Crysis 3 onto a new island (hence the name) which, based on all the screenshots we've seen, appears to have more in common with the environments seen in earlier Crysis titles than the latest addition to the franchise. 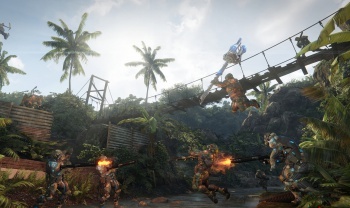 "The gameplay in the Crysis series has always been deeply connected to the unique environments in which the action takes place," writes CEO of developer Crytek, Cevat Yerli, in this morning's PR blast. "By transporting players out of the Liberty Dome and into the Lost Island setting, we're not only returning to Crysis' spiritual roots, but also introducing fresh ways to play that provide Crysis 3 fans with genuinely game-changing new tactical options, game modes and weapons." While we're almost positive that Yerli's comment about "genuinely game-changing" additions is a bit of harmless developer hyperbole, these new maps do look gorgeous - and that's saying something given how attractive Crysis 3 was to begin with. Actually, seeing the most recent iteration of the CryENGINE render gorgeous jungle vistas like this makes me nostalgic for the earlier Crysis titles, and, in turn, the original Crytek-developed Far Cry. Now my mind is imagining an alternate timeline in which Crytek stayed with the Far Cry franchise and the recent, phenomenal Far Cry 3 was built on top of the graphics tech that powers Crysis 3. In this parallel universe we're all incredibly wealthy and attractive too, so I think you'll agree that our current timeline is a huge disappointment. In Crysis 3: The Lost Island, traces of a mysterious alien presence have been discovered on a small island in the Philippines 200 miles from Ling Shan. Rebel forces have been dispatched to destroy this unknown extraterrestrial entity before an elite CELL team has the chance to obtain it ... by any means necessary. As little as that truly matters, any excuse to get back to pretty, CryENGINE-generated jungles is cool by me. If you're likewise intrigued, you can download The Lost Island for $15 on June 4, regardless of which platform you enjoy Crysis 3 on.